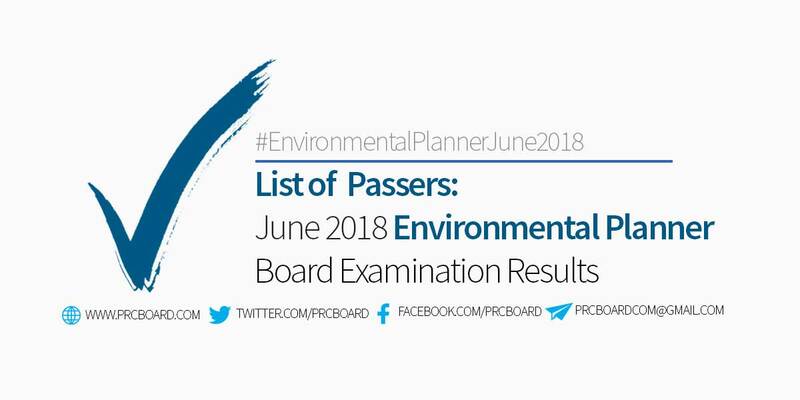 MANILA, Philippines (Released June 13, 2018) – The June 2018 Environmental Planner Board Exam results including the list of passers, top 10 examinees, performance of schools, among other important announcements are available at this website as the Professional Regulation Commission (PRC) releases the results online three (3) working days after the last day of board examination. As announced, 1,891 out of 4,729 successfully passed the exams. As per PRC Resolution No. 2017-1068 series of 2017 or the “Schedule of Licensure Examination for Year 2018”, the target release date of June 2018 Environmental Planner result will be in three (3) working days after the last day of board examinations or by Wednesday, June 13, 2018. The computed release date is with respect to a declared nationwide holiday on June 12, 2018 (Philippine Independence Day). On the same exams conducted by PRC on June 2017 and June 2016, results were released after two (2) working days. On June 2015 and June 2014, results were out after three (3) working days. The schedule of online appointment for issuance of Professional ID and Certificate of Registration will be from June 20 to June 29, 2018. Environmental Planning is one of the programs with less number of examinees being administered by PRC. During June 2016 of the same exams, 542 out of 1,010 examinees passed. The first three spots in the list of topnotchers all came from University of the Philippines (UP) Diliman. Kim Robert Cuevas de Leon garnered 83.50% followed by Maria Teresa Salas Alambra and Christian Resurrection Buted having 82.60% and 82.45% respective ratings. You may also want to view the statistics of Environmental Planning board exams in the last seven (7) years. To receive up-to-date news on Environmental Planning board exam result for June 2018, we advise our visitors to bookmark this page, visit PRC official website, follow us at our social media pages via Facebook and Twitter or join the members discussions at our Facebook Group. taga san po kayo sir? Pero wala pa naman ang result, ryt? paano yung walang lumabas na rating kahit kompleto na yung entry ganito pa rin ang lumalabas "no result found", yun kaya ang dahilan kung my erasure yung test paper mo? Until now rating verification is not available.